The distillery is located along the Cayuga Wine Trail overlooking Cayuga Lake, about 20 minutes from Ithaca, NY (which is to the south) and 20 minutes from Waterloo, NY (which is to the north). It is surrounded by the Myer Farm fields from which we harvest and then use International Certification Services Certified Organic Grain in our products. The tasting room has a large viewing window into the still house, from which one can see the still. The still house is built from hand-cut and finished Pennsylvania bluestone and colonial wallstone. Typically we are open 11-6 from April 1- Dec 31st; and open 11-5 from Jan-March. Please call the tasting room to confirm seasonal hours. 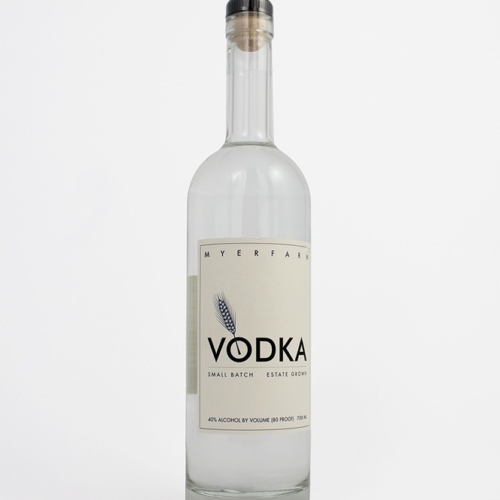 Distilled from 100% Myer Farm organic soft white winter wheat, this smooth and creamy vodka releases the essence of wheat mid-palate and finishes with a bit of sweetness. 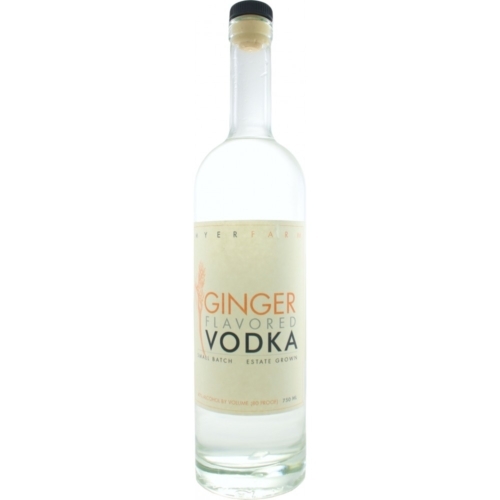 Distilled from Myer Farm certified organic wheat (100%), this flavored vodka features fresh organic ginger root grown locally by Good Life Farm (Finger Lakes Cider House). Enjoy this flavored vodka at room temperature for a more floral and citrus experience; drink it chilled for more ginger, butter, and pepperoncini. 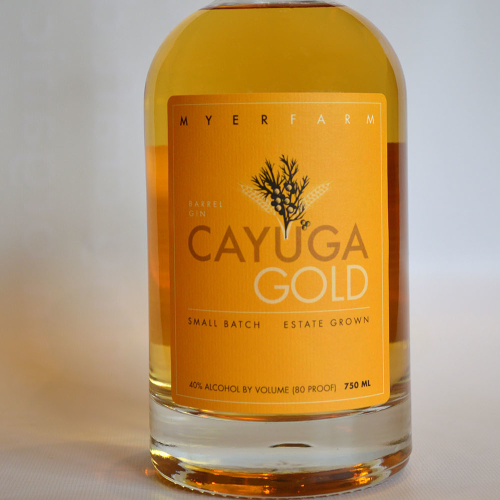 Distilled and Bottled by Myer Farm Distillers, Ovid, NY. 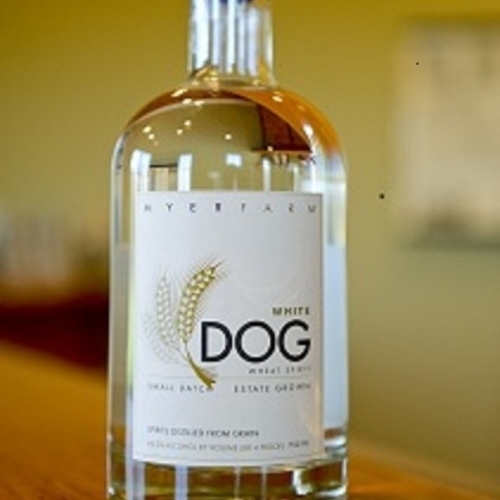 Triple distilled from certified organic soft white winter wheat grown and harvested on Myer Farm, est. 1868, and flavored with freshly ground, shade-grown, fare-trade coffee beans from Gimme! Coffee. 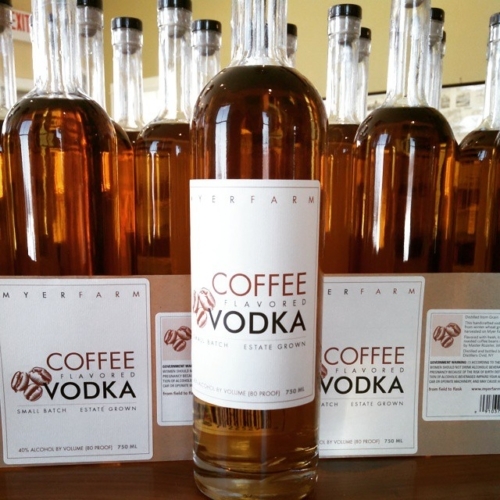 This vodka opens with rich and nutty notes of chocolate-covered espresso beans and settles into notes of vanilla and chocolate Italian pirouette wafer cookies. 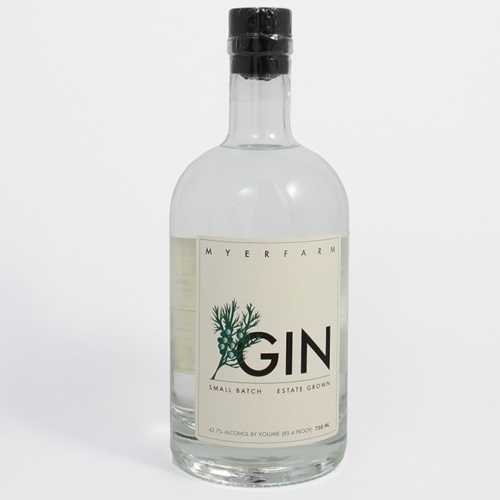 Myer Farm Distillers' own contemporary dry gin, distilled from certified organic soft white winter wheat grown and harvested on Myer Farm, est. 1868. Produced with a vapor infusion of ten traditional and rare botanicals, a single sip suggests a cottage garden is only a pour away. Best of Category and Silver Medal. A distiller's choice cut of gin, made from certified organic soft white winter wheat grown and harvested on Myer Farm, est. 1868, aged in our own John Myer Whiskey barrels. A unique, light and smooth whiskey-like spirit, with hints of cinnamon and cardamom to spice up any classic specialty cocktail. 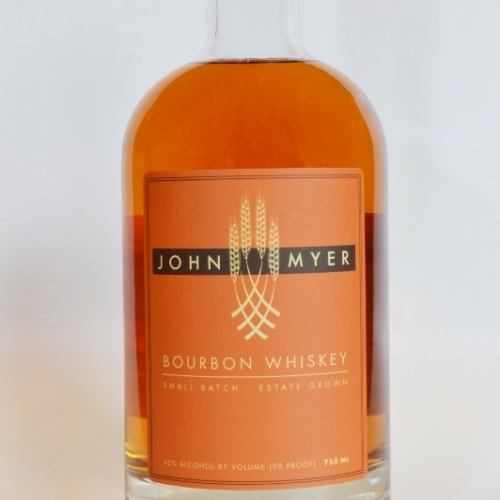 An original bourbon, made from certified organic corn, barley, rye, and wheat harvested on Myer Farm, est. 1868. This whiskey greets the nose with amaretto and rose, seduces the palate with mandarin citrus, lightly roasted corn and hints of absinthe and hops. The finish is incredibly smooth with lingering notes of leather, barley, and maple syrup. 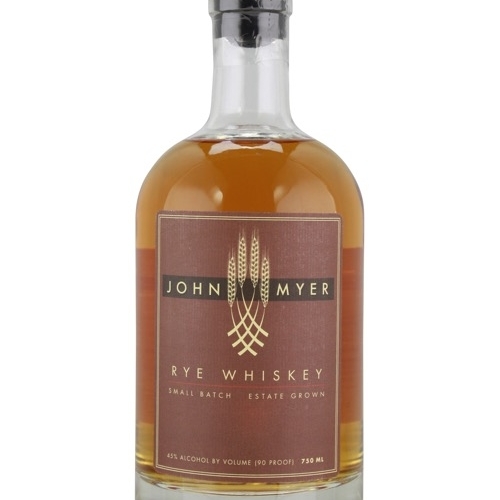 A whiskey made from certified organic rye and other grains grown and harvested on Myer Farm, est. 1868, with an orange zest that opens to maple syrup and absinthe, creamed cereal and hot cinnamon. Traditional notes of rye grass and spice round out the palate. 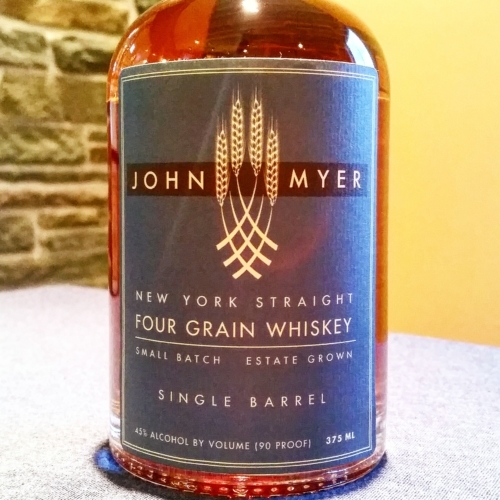 Think of the Four Grain as a bourbon's sophisticated uncle: less corny and more complex. 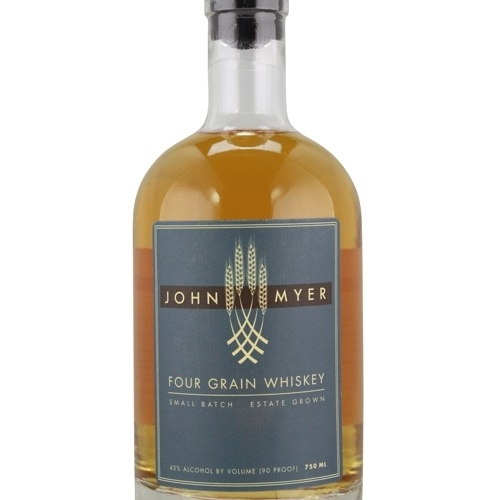 Made from a distiller's choice quartet of certified organic grains grown and harvested on Myer Farm, est. 1868. This whiskey features a cherry and cognac nose that opens the palate to leather and tobacco, toasted almond and fig. Ripe blackcurrant resonates with hints of elderberry in the finish. 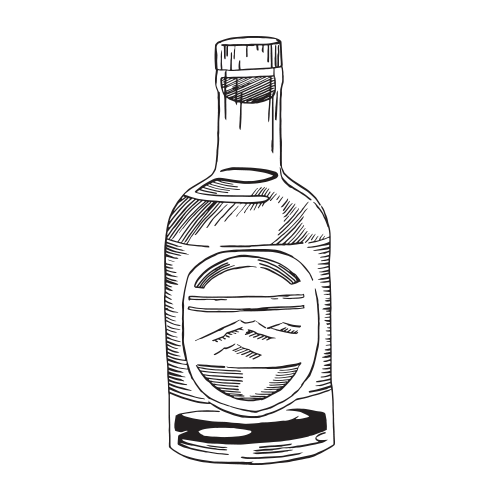 A rich, scotch-like whiskey made from certified organic grain grown and harvested on Myer Farm, est. 1868. Earthy and sawn timber notes give way to ripe stone fruit and brown sugar with vanilla and black pepper lingering in the finish. 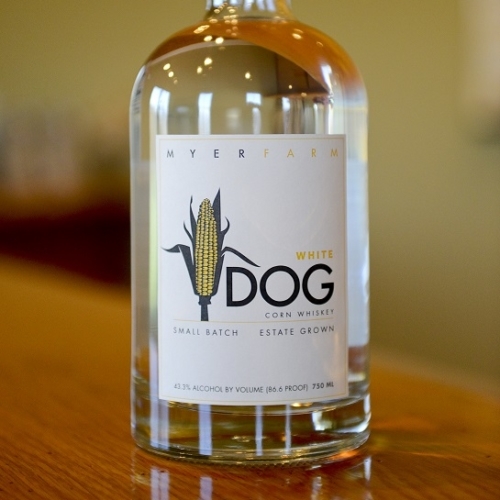 Distilled from Myer Farm certified organic corn (60%), barley, rye, and wheat. A nose of black pepper and cherry blossom opens the palate to balanced notes of verbena and fresh-rolled barley. Yielding a plush velvet mouth-feel, this 2-year-old single-barrel bourbon offers a hint of red raspberry and rich butter caramel in a smooth, long finish. 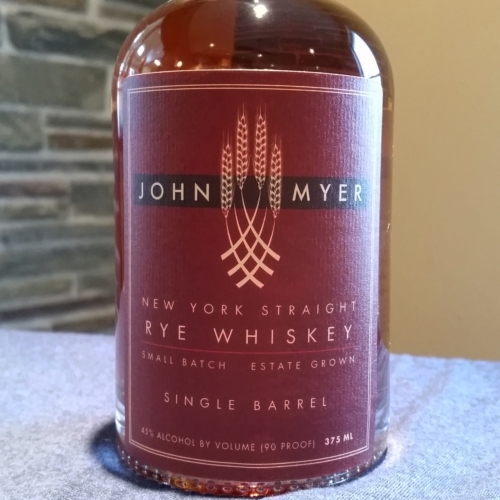 Distilled from Myer Farm organic rye (70%), corn, and barley. A cherry and amaretto nose opens the palate to initial flavors of orange marmalade, porridge, and brown sugar. Hints of fresh herb, bread, and butterscotch highlight the midpalate while buckwheat honey and maraschino cherry linger in the finish of this 2-year-old single-barrel whiskey. With a nose of eggnog, toasted marshmallow, and ginger snaps, this specialty spirit--essentially a ginger-infused rye whiskey--yields notes to the palate of heavy cream, nutmeg, butterscotch, and orangezest among the predominate flavor of a ginger snap cookie. 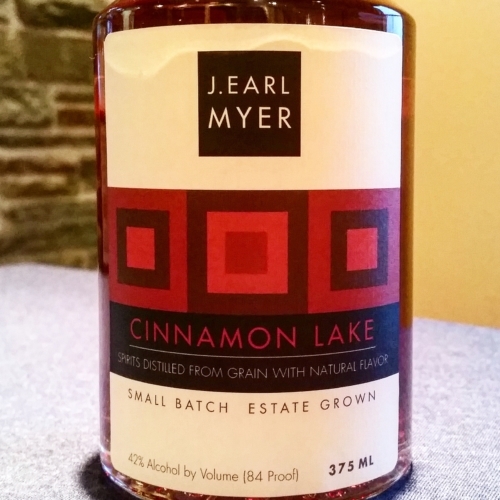 J. Earl Myer Cinnamon Lake features wheat spirit distilled from Myer Farm certified organic wheat that is then infused for over 6 weeks with cinnamon bark, then strained and aged in new oak for over 12 months. The resultant whiskey is then finished with fresh Mexican vanilla bean. Bottled at 84 proof. 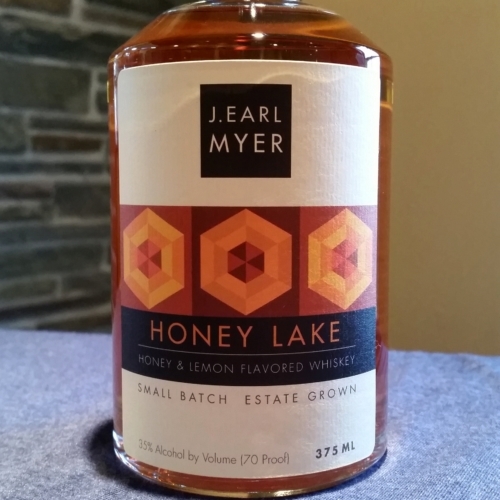 J. Earl Myer Honey Lake is a honey & lemon infused whiskey that features John Myer New York Straight Four Grain Whiskey, made from certified organic grain from Myer Farm, infused with local, raw honey and lemon peel. Bottled at 70 proof. 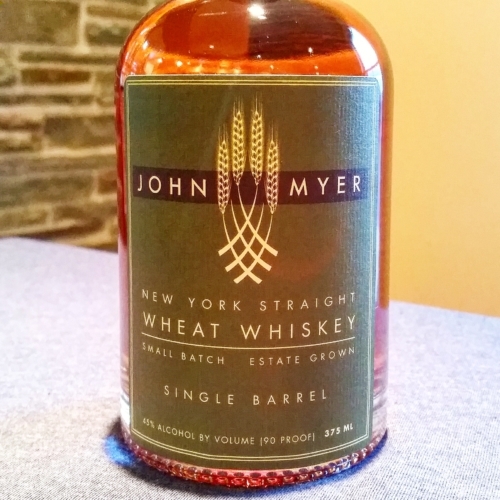 Distilled from 100% Myer Farm certified organic wheat, this 2-year single barrel whiskey presents vanilla, nutmeg, cedar and orange peel on the nose; a creamy and smooth mouth-feel with maraschino cherry and amaretto toffee on the palate; and a finish of vanilla and crème brûlée. Bottled at 90 proof. 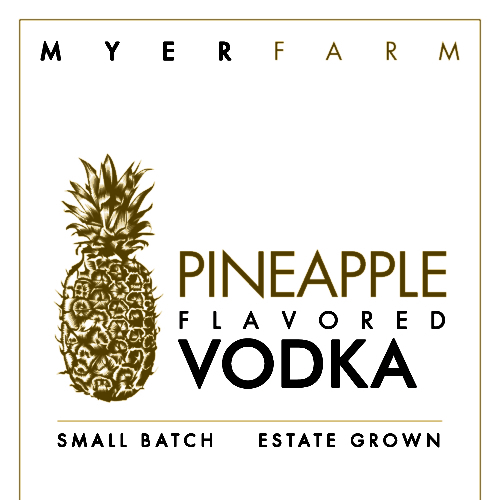 Distilled from Myer Farm certified organic wheat (100%) this vodka features fresh pineapple farm-sourced from Costa Rica. Notes of carmelized brown sugar, lemon pound cake, and ginger spritz. Featuring 100% Myer Farm certified organic corn, this white dog, tastes of hot-buttered popcorn, cornbread, and a hint of lemon. Bottled at 86.6 proof. 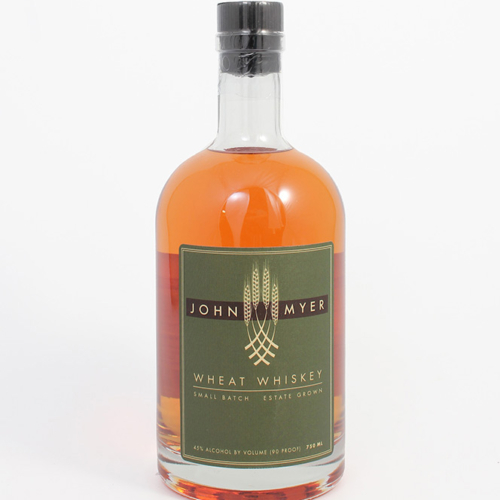 Distilled from Myer Farm certified organic wheat, this take on white lightning offers notes of cacao, caramel, and apricot. Bottled at 88.4 proof. 375 mL	Black cherry, currant, vanilla, leather. 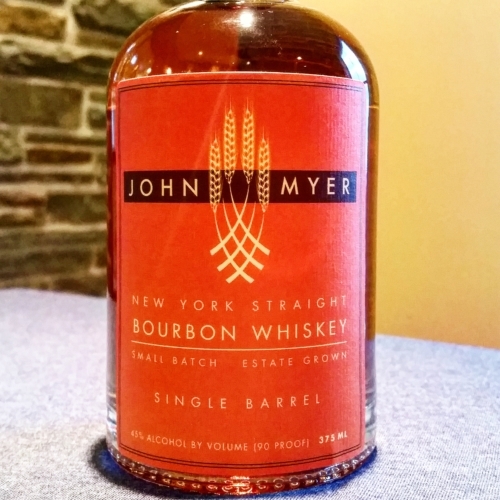 Distilled from Myer Farm certified organic corn (47%), wheat, rye, and barley, this 2-year single barrel whiskey presents cherry and cognac on the nose, dark cherry and black currant on the palate, finishing with vanilla, butter, and leather.